Well, I wouldn't say that is totally true but if anyone has been to Sports Authority you know that their blasters and rack packs are overpriced. I took the liberty of asking them to price match Target on a blaster of 2009 O-Pee-Chee since they were marked $24.99, and the guy told me I would need a flyer. I told him that they are never in the ads and I would go upstairs to Target and take a picture of all the blaster prices and come back, he said don't worry about it and gave it to me for $19.99. Hooray! I was so excited to have found the blasters that I never bothered looking at the box to see which cards were on it til about 30 minutes later in Barnes and Noble. I ended up with Jeter and Hanley Ramirez, which is great because I have a Pujols incoming from Baseball Dad. There was one blaster left, and I saved my receipt so that after class I can stop there and see if the other one is still there and snag it. 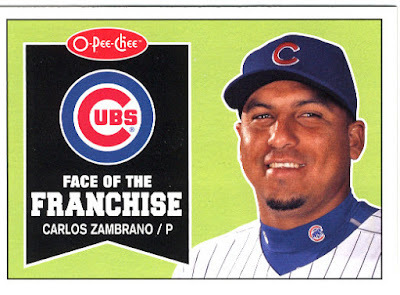 I love baseball cards. 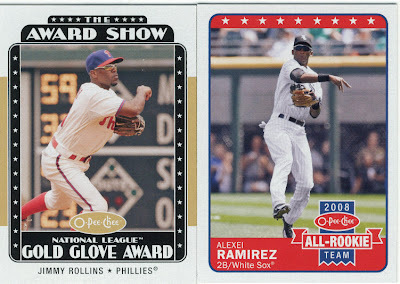 Here are some of the highlights from the blaster. I got one card that is probably my favorite so far, and it has nothing to do with Pujols (who has not made an appearance in my packs or Sooz's yet). 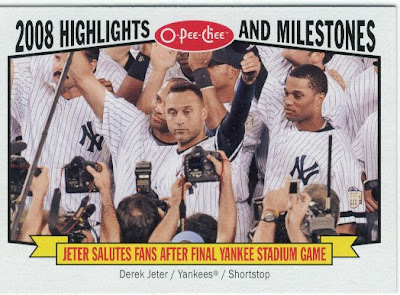 It is a Jeter card and it is from the last game at Yankee Stadium, which both myself and Sooz were at and this was probably one of the moments I will always remember from the Stadium. These are the rookies I pulled, I am not sure if I am going to do a complete set or not, so I am not trading anything from this set just yet. I will trade black cards and SP's, just not the base yet. 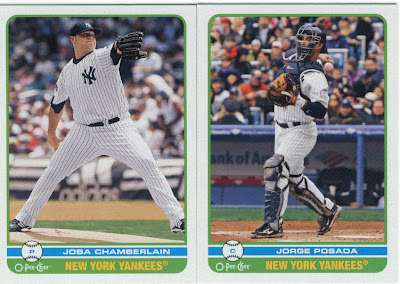 I don't think I have completed a set since 2004 or 2005 of anything, though I did end up with a 2007 Topps Series 1 only because I was chasing the Jeter error. Hopefully I will be back later with the story that I found another blaster. I really like those team checklists. Sweet deal ! I just sent out your Puhols box bottom card with a Cano and a Yankee Stadium Legacy you didn't have listed.If you haven't sent my wrapper yet,I sure would like the Sizemore ! 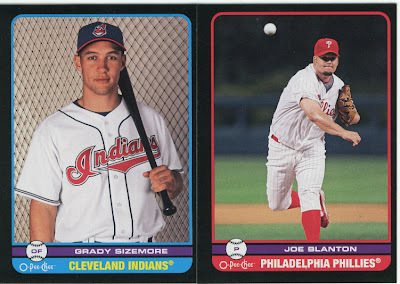 Baseball Dad, the Sizemore is already in your package. I actually had to open it to scan the card then put it back. It was going to be a surprise, but it was too nice of a card to not put up for everyone to see. Poor Canuck... Where did you order these boxes from? Because of your post I found a decent deal online for a 2 box lot and placed my order. 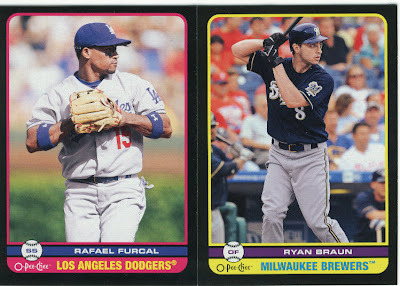 I love the look of these cards...like something out of the 1970's or a 1980's Fleer. I love the new-retro style that O-Pee-Chee is using. 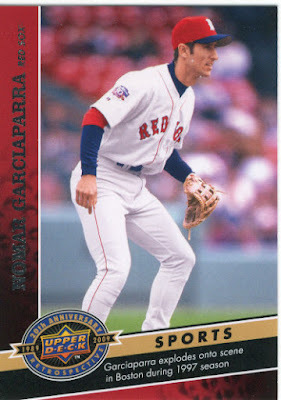 If they keep this up I might make them my number one go to card, especially for TTM. Wow. 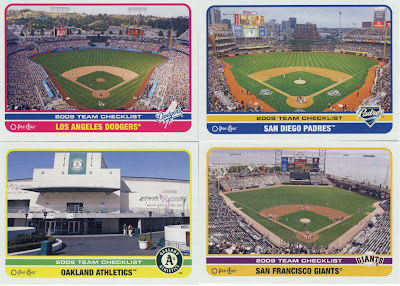 Some of the Stadium / team checklist cards photos are just horrible--particularly the Bay Area ballparks. Oakland's hasn't been called Network Associates in five years, and that photo looks like an entrance to a prison. It's begging for some kind of crushingly optimistic slogan as you'd walk in, something like "Perpetual Losing In Here Makes You Feel Better Out There". By all accounts, Telco Park in San Francisco is a nice place for a ballgame, but what's with the photo? What's going on down there on the field? Four sqare? The washed out photo, empty stands, and weird field activity makes AT&T look like it's rookie-ball Hungry Buns Ballpark in East Porkington, Wisconsin, Home of the Boneless Weiners! 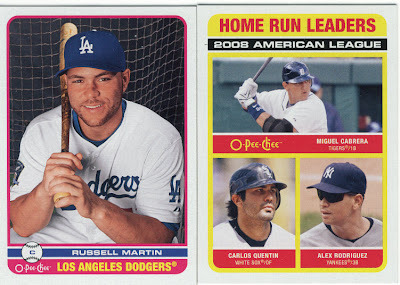 Naturally, Dodger Stadium's card looks like it's Kirk Gibson Day, every day. Nice! 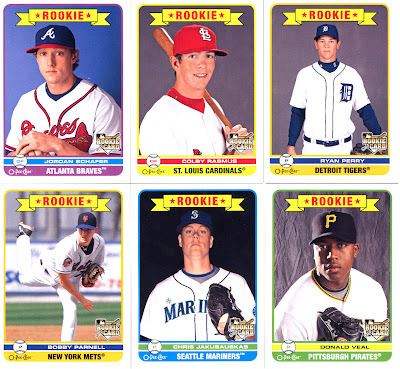 I like the Rookies... makes me want to go run out and buy a blaster today.